A. Westerski, T. Dalamagas, and C. A. Iglesias, "Classifying and comparing community innovation in Idea Management Systems", Decision Support Systems, vol. 54, iss. 3, 2013. G. Poveda, A. Westerski, and C. A. Iglesias, "Application of Semantic Search in Idea Management Systems", in 7th International Conference for Internet Technology and Secured Transactions, London, United Kingdom, 2012. A. Westerski, C. A. Iglesias, and J. E. Garcia, "Idea Relationship Analysis in Open Innovation Crowdsourcing Systems", in 8th IEEE International Conference on Collaborative Computing: Networking, Applications and Worksharing, Pittsburgh, United States, 2012. A. Westerski and C. A. Iglesias, "Mining Sentiments in Idea Management Systems as a Tool for Rating Ideas", in Large-Scale Idea Management and Deliberation workshop. 10th International Conference on the Design of Cooperative Systems (COOP2012), Marseille, France, 2012. 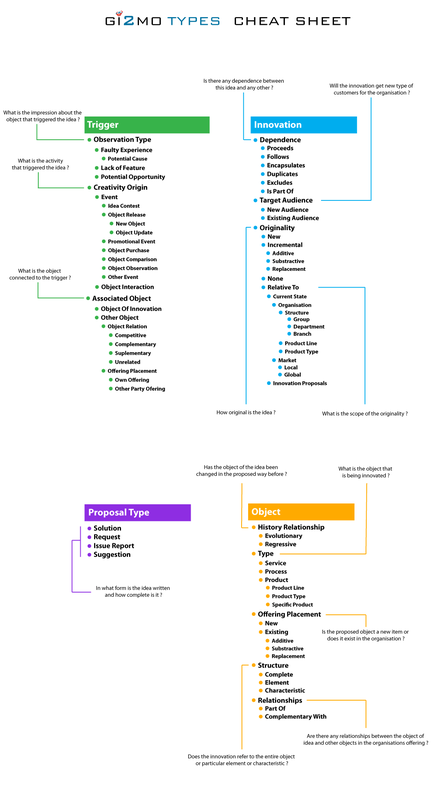 G. Anadiotis, K. Kafentzis, J. Pavlopoulos, and A. Westerski, "Building Consensus via a Semantic Web Collaborative Space", in WWW 2012 Companion Proceedings. Semantic Web Collaborative Spaces Workshop (SWCS2012), Lyon, France, 2012. A. Westerski, C. A. Iglesias, and F. T. Rico, "Linked Opinions: Describing Sentiments on the Structured Web of Data", in 4th international workshop Social Data on the Web (SDoW2011), Bonn, Germany, 2011. A. Westerski and C. A. Iglesias, "Exploiting Structured Linked Data in Enterprise Knowledge Management Systems: An Idea Management Case Study", in 6th International Workshop on Vocabularies, Ontologies and Rules for The Enterprise (VORTE 2011), Helsinki, Finland, 2011. A. Westerski, "Gi2MO: Interoperability, Linking and Filtering in Idea Management Systems", in Extended Semantic Web Conference 2011. PhD Symposium Poster., Heraklion, Greece, 2011. 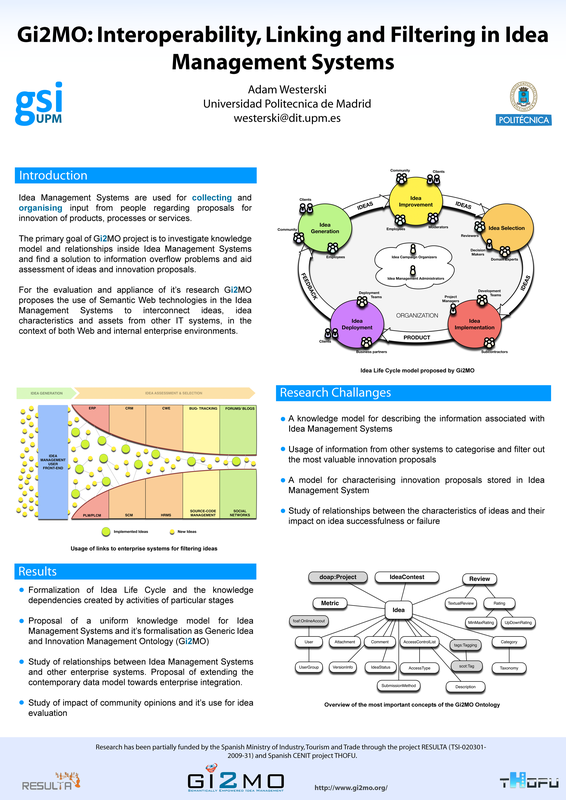 A. Westerski, C. A. Iglesias, and T. Nagle, "The Road from Community Ideas to Organisational Innovation: A Life Cycle Survey of Idea Management Systems", A Special Issue of the Journal Web-Based Communities. Community-based Innovation: Designing Shared Spaces for Collaborative Creativity., 2011. A. Westerski, C. A. Iglesias, and F. T. Rico, "A Model for Integration and Interlinking of Idea Management Systems. ", in 4th Metadata and Semantics Research Conference (MTSR 2010), Alcalá de Henares, Spain, 2010. A. Westerski, "Semantic Technologies in Idea Management Systems: A Model for Interoperability, Linking and Filtering," PhD Thesis , 2013. G. P. Cardona, "Asistente para la Creacion de Consultas Semanticas. Aplicacion a la Fabrica de Ideas de Proyectos de Codigo Abierto Ubuntu Ideas," Master's Dissertation , 2011. F. T. Rico, "Aplicacion de Tecnicas de Analisis de Sentimientos a la Gestion de Innovacion con Fabrica de Ideas," Master's Dissertation , 2010. G. Convertino, A. Westerski, A. De Liddo, and P. Diaz, "Large-Scale Ideation & Deliberation: Tools and Studies in Organizations", Journal of Social Media for Organizations, vol. 2, iss. 1, 2015. G. Convertino, M. Klein, A. De Liddo, A. Westerski, P. Diaz, M. Hardas, L. Xiao, C. Bartolini, and J. Folk, "Large-Scale Idea Management and Deliberation Systems Workshop", in Large-Scale Idea Management and Deliberation Systems Workshop, 6th International Conference on Communities and Technologies (C&T2013), Munich, Germany, 2013.